Fresh charbroiled snapper, skirt steak, and sautéed prawns topped with ranchera and tomatillo salsas served with rice, refried beans and tortillas. Fresh Blue Point oysters served raw. Tortilla chips topped with refried beans, cheese, salsa fresca, sour cream and guacamole. Calamari, octopus and shrimp marinated in citrus juices. Crispy corn tortillas filled with shredded chicken or shredded beef served with salsa, sour cream and guacamole. 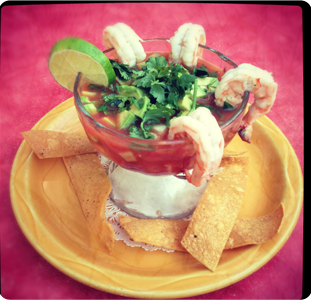 Prawns or calamari, octopus and shrimp served in a chilled tomato broth with diced avocado, cucumber, green onion, cilantro and crispy tortilla chips. Shredded chicken or beef taquitos served with a half order of chicken rollos. Spiced chicken broth with shredded chicken, crispy tortilla strips, diced avocado, cilantro and queso fresco. Simmered bone-in pork and hominy in a New Mexico chile broth with shredded cabbage, cilantro, onion and salsa fresca. Served with tortillas. House salad topped with grilled chicken sautéed in tomatillo salsa, salsa fresca, whole beans and sliced avocado. Fresh organic mixed baby greens with almonds, dried cranberries, gorgonzola cheese and fresh apple slices in a citrus vinaigrette. Topped with crispy chipotle tortilla strips. Seasoned fresh filet of Ahi tuna on organic mixed baby greens tossed in a wasabi vinaigrette, topped with roasted red bell pepper, sliced cucumber, tomato, avocado and a wasabi glaze. Entrees served with rice and beans or house salad. Prawns sautéed in a spicy guajillo salsa served with tortillas. Charbroiled snapper topped with a sautéed tomatillo or guajillo salsa served with guacamole, sour cream and tortillas. Crispy corn tortilla topped with shredded cabbage, calamari, octopus and shrimp mix and guacamole. Rice and beans not included. Prawns and fresh garden vegetables sautéed with tomatillo salsa served with tortillas. Handmade corn tortillas filled with sautéed shrimp or charbroiled snapper, salsa ranchera and Linda’s cabbage. Flour tortilla filled with sautéed shrimp, whole beans, salsa fresca, salsa ranchera and cheese, topped with tomatillo salsa and cheese. Handmade corn tortillas puffed into soft shells filled with choice of shredded chicken, shredded beef, ground beef or guacamole with beans topped with salsa fresca, shredded cabbage and sour cream. Corn tortillas filled with grilled chicken topped with green tomatillo sauce, melted cheese, Linda’s cabbage, sour cream and guacamole. Simmered pork in a tomatillo sauce or guajillo sauce served with tortillas. Handmade corn tortillas filled with skirt steak, tomatillo salsa, chopped cilantro and onions. Corn tortillas filled with shredded chicken, shredded beef or cheese topped with red enchilada sauce, shredded cabbage, salsa fresca and sour cream. Crispy flour tortilla filled with grilled chicken, whole beans, bell peppers, onions and cheese topped with salsa ranchera, sour cream and guacamole. Grilled chicken with sweet and savory mole sauce served with tortillas. Marinated rib-eye steak charbroiled to desired temperature served on tomatillo salsa with guacamole and tortillas. Charbroiled strips of skirt steak served on salsa ranchera with Linda’s cabbage, cheese, sliced avocado and tortillas. Corn tortillas filled with grilled chicken topped with red enchilada sauce, melted cheese, Linda’s cabbage, guacamole and sour cream. Served sizzling with sautéed bell peppers, onions and ranchera salsa, guacamole, sour cream, salsa fresca and tortillas. Flour tortilla filled with refried beans, rice and cheese topped with cheese, guacamole and salsa fresca. A crispy corn tortilla topped with beans, cheese, guacamole, shredded cabbage, salsa fresca and sour cream. Flour tortilla filled with sautéed garden vegetables, in salsa ranchera and salsa fresca, whole beans and cheese topped with salsa ranchera. taco, tostada, enchilada, chile relleno & sope. • All parties with 6 or more guests will include a 18% gratuity on the dining bill (even if check is split). Checks can only be spilt up to three ways. • Any outside desserts brought into the restaurant will incur a $12 dessert fee. • Our corkage fees are $15 per 750 ml bottle and $25 per magnum. • We do not allow any outside food or beverages to be brought into the restaurant. • Consuming raw or under cooked meats, poultry, seafood, shellfish, or eggs may increase your risk of foodborne illness.